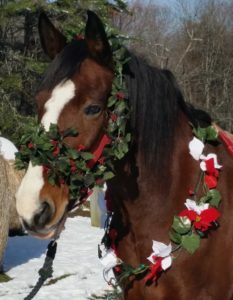 Maine Winter brings a serenity and glimmer that is best experienced in a horse drawn sleigh being pulled through the Winter Wonderland of Casco, right in the heart of the Sebago Lakes Region. Enjoy the sparkling snow-covered trees and fields of snow drifting on the wind while you glide along with family and friends to enjoy this wonderful season together. We have private and group sleighs available. Enjoy a date night that she will never forget or a family outing the kids will not stop talking about. Reservations can be made for group rides on the Wednesday before the weekend you want to go on your sleigh ride. Please do not reserve before that time. We have to know the weather and the trail conditions before accepting group sleigh ride reservations. The small red sleigh is for Couples Sleigh Rides only. This quiet, private ride is a great way to enjoy your anniversay, Valentine’s Day or propose! But it can’t be beat for a way to reconnect with your loved ones on any day for any reason. Monday through Friday – $150 per couple. 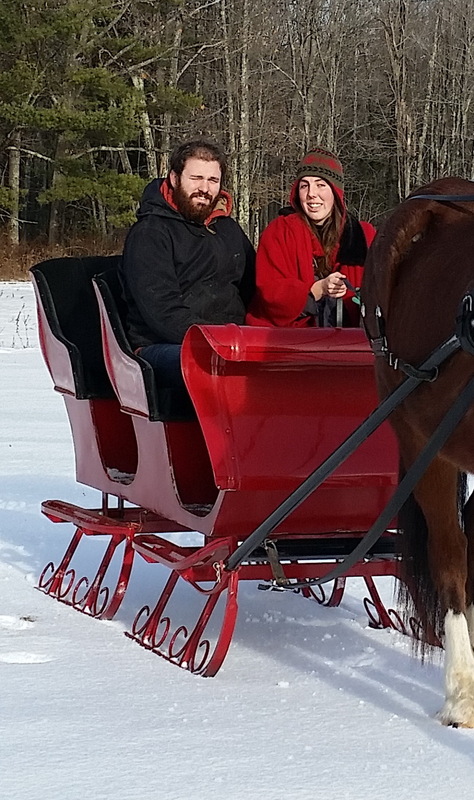 Both sleighs are available during the week for groups or individuals that would like to join us for a sleigh ride. The larger sleigh can be reserved for a group of 6 adults and up to 6 “lap” children per ride, for 30 minutes for $225 and the red sleigh can be reserved for a couple for 30 minutes for $150. Hot cocoa and a homemade dessert are part of the fun! 2017/2018 SLEIGH RIDE Groupon Holders will be extended to the last weekend in March 2019. Reservations will only be last minute, within three days so we know the weather and trail conditions. And weekends may be limited, we will announce that at the beginning of the 2019 season. Sleigh ride Groupons can be exchanged for trail rides in the summer months. A Group Sleigh ride Groupon for two is worth $30 toward a $130 trail ride for two and so on. 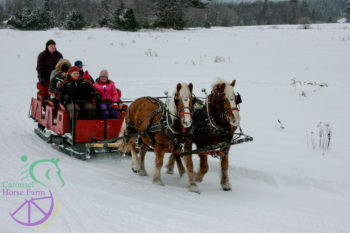 A Group Sleigh ride for four is worth $60 toward a $130 trail ride for two or a $260 trail ride for four. Just to give you an idea of how it would work. Remember to use the on-line reservation form to make a reservation with a Groupon. 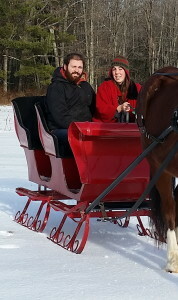 The large sleigh holds 6 adults and will be available 11 to 3 every weekend as long as trail conditions are favorable. Reservations are recommended but not required. The cost is $20 per adult, $10 for children 4 to 12 (all children must be accompanied by an adult) or $55 for a family of four with two children under the age of 13. The way our reservation system will work, is that we will give our customers a time, such as 1 pm. Everyone should arrive and be ready to board at 1 pm, but if others reserved for the same time were here earlier they will go first and your group may have to wait until the 1:30 trip. That way if anyone shows up late, we can still fill each ride and be ready for the next one. So be prepared to come have a good time, hang out around the fire and watch everyone enjoy themselves. We will not reserve more people per hour than we can take so you will be guaranteed a spot during that hour. These rides are about 20 minutes long to ensure that the horses get a 10 minute rest between each trip. Sleigh rides will begin as soon as we have at least two storms equaling 8 or more inches of snow. The sleighs will travel through our property and along a wooded trail out to the back pasture with a great view of Mt. Washington. We will circle the pasture and make several passes for the best views of the mountains. We often see deer and wild turkey in our pine grove too! Weekend rides last approximately 20 mins. If you’d like a longer ride you can reserve outside our regular hours at our normal rates. Need a Place to Stay and Sleigh? Wolf Cove Inn stays open all winter long and will help you set up all of your winter activities in the area. Visit their site at www.wolfcoveinn.com or call for a reservation in their beautiful Inn by the lake in Poland. Carriages, Wagons and Wagonette are available on farm and off for special events.